"Who can act as a companion during labour and childbirth? The companion can be any person chosen by the woman to provide her with continuous support during labour and childbirth. This may be someone from the woman’s family or social network, such as her spouse/partner, a female friend or relative, a community member (such as a female community leader, health worker or traditional birth attendant) or a doula (i.e. a woman who has specialty training in labour support but is not part of the healthcare facility’s professional staff ). A Cochrane systematic review concluded that all types of labour companions are effective, but that the benefits of support are highest when it is offered by individuals who are not part of the facility’s professional staff . The potential functions of the companion of choice should be clearly stated at the facility level, and should be agreed upon between the woman, her companion and health-care providers. It may be beneficial for the facility to offer orientation sessions for the companion before the delivery on his or her role in supporting the woman during labour and childbirth. Barriers to implementation Despite clear evidence and the growing emphasis on respectful maternity care, many health-care facilities still do not permit women to have a companion of choice during labour and childbirth. Several barriers have been identified. -negative attitudes of health-care providers towards labour companionship. The way forward Simple measures can be taken to address concerns about labour companionship. A clear first step is for health-care facilities to establish supportive policies that allow and encourage women to have companions during labour and childbirth. Secondly, facilities should provide women with information and the means to make informed decisions in this regard, ideally during antenatal care visits, so each woman has sufficient time to prepare. For these interventions to be effective, it is important to respect women’s rights to privacy and confidentially at the facility. This may necessitate physical modifications to the space provided for labour and delivery at the facility. When implemented, the programmes for ensuring that each woman in labour has the support of her companion of choice (if she wants one) should be evaluated in order to share successes and address any persisting barriers with administrators and health-care providers at the facility. For implementation to be successful, it is crucial that health-care providers understand the benefits and potential caveats of labour companionship, as well as the importance of supporting pregnant women to decide whether they want a labour and childbirth companion, whom to choose and what role they want the companion to play on their behalf. A participatory approach is key to introducing labour companionship policies at the health-care facility. By establishing a committee comprising representatives of health-care providers, facility managers and women themselves (i.e. advocates or members of women’s organizations), concerns from all sides can be considered and solutions can be identified that work for everyone. Doula–a new concept in obstetrics. The results showed a substantial improvement in outcomes for women who had both a birth partner and a doula, compared to having a birth partner alone. The Cesarean rate for these first-time mothers was 25% in the group with a partner only, and 13.4% in the group with a partner and doula. The women who had their labor medically induced experienced an even more striking decrease in the Cesarean rate with a doula—the Cesarean rate with labor inductions was 58.8% in the group without a doula, and 12.5% in the group with a doula. Also, fewer women in the doula group required an epidural (64.7%) compared to those without a doula (76%). Research has shown that the most positive birth experiences for fathers were ones where they had continuous support by a doula or a midwife. In the McGrath and Kennell study, the women and their partners who had a doula overwhelmingly rated the support of their doula as positive—with 93% rating their experience with the doula as very positive, and 7% as positive. In other studies, fathers have said that when they had labor support from a midwife or doula, things were explained to them, their questions were answered, their labor support efforts were guided and effective, and they could take breaks from the emotional intensity of the labor without abandoning their laboring partner (Johansson, 2015). Abstract: Eleven randomized control trials examined whether additional support by a trained lay person (called a doula), student midwife or midwife, who provides continuous support consisting of praise, encouragement, reassurance, comfort measures, physical contact and explanations about progress during labor, will affect obstetrical and neonatal outcomes. The women were healthy primigravidas at term. Meta-analysis of these studies showed a reduction in the duration of labor, the use of medications for pain relief, operative vaginal delivery, and in many studies a reduction in caesarian deliveries. At 6 weeks after delivery in one study a greater proportion of doula-supported women were breastfeeding, reported greater self-esteem, less depression, a higher regard for their babies and their ability to care for them compared to the control mothers. Observations during labor showed that fathers remained farther away from mothers than doulas, talked and touched less. When the doula was present with the couple during labor the father offered more personal support. The father-to-be’s presence during labor and delivery is important to the mother and father, but it is the presence of the doula that results in significant benefits in outcome. After praise and encouragement: emotional support strategies used by birth doulas in the USA and Canada. OBJECTIVE: to describe in detail the emotional support techniques employed by birth doulas during labour. DESIGN: grounded theory methodology was utilised in collecting and analysing interviews given by doulas and mothers who had doula care. By using both informants, a clearer picture of what constitutes emotional support by doulas emerged. PARTICIPANTS: 10 mothers from three different states in the Midwestern USA and 30 doulas from 10 different states and two Canadian provinces were interviewed. Two doulas worked in hospital-based programmes whereas the others had independent practices. Doulas usually attended births in hospitals where medical attendants spent little focused time with the mother. FINDINGS: nine different strategies were distinguished. Four strategies (reassurance, encouragement, praise, explaining) were similar to those attributed to nurses in published research. Five were original and described as only being used by doulas (mirroring, acceptance, reinforcing, reframing, debriefing). CONCLUSIONS: emotional support by professional birth doulas is more complex and sophisticated than previously surmised. Mothers experienced these strategies as extremely meaningful and significant with their ability to cope and influencing the course of their labour. IMPLICATIONS FOR PRACTICE: the doula’s role in providing emotional support is distinct from the obstetric nurse and midwife. Professional doulas utilise intricate and complex emotional support skills when providing continuous support for women in labour. Application of these skills may provide an explanation for the positive ‚doula effect‘ on obstetric and neonatal outcomes in certain settings. "This study demonstrates that DONA-trained doulas are using many techniques to assist couples to integrate changes in the birth process that deviate from the client’s plan. 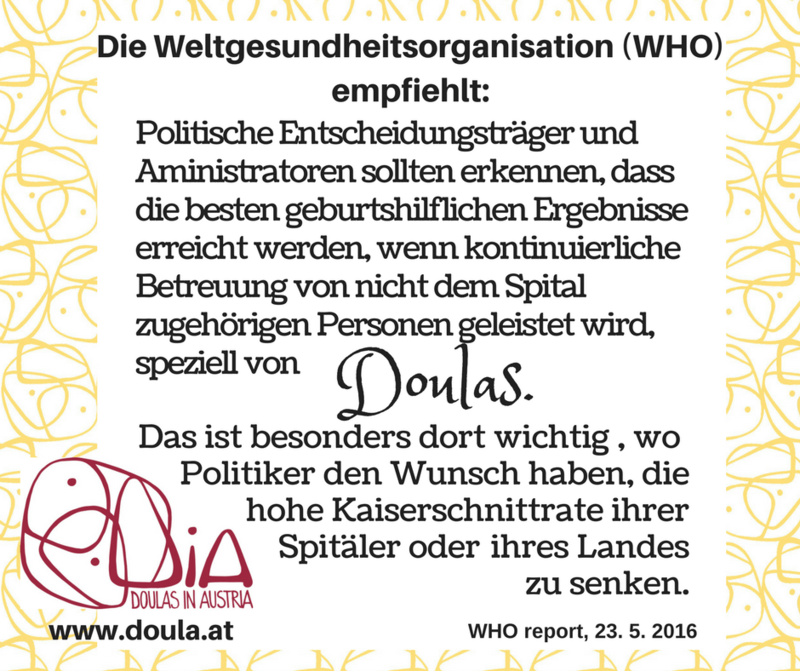 DONA doulas appear to be acting in accordance with their standards of practice. This study shows that there are almost inevitable conflicts that evolve from the intrinsic role overlap between care providers and doulas. Whether and how these conflicts will or will not be actualized is another area for study. When doulas provide their clients with information, this can be perceived as in conflict with the role of care providers. For optimum care and outcome, it is essential that all players accept and respect each other’s unique roles. To achieve this, education of all health-care professionals is necessary so that the doula’s role and scope of practice is clearly understood." Effects of psychosocial support during labour and childbirth on breastfeeding, medical interventions, and mothers‘ wellbeing in a Mexican public hospital: a randomised clinical trial. Documentary produced by DONA International in 2010 featuring commentary by all of DONA International’s esteemed founders and some of its celebrated past presidents speaking on the origin and rationale of doula support.